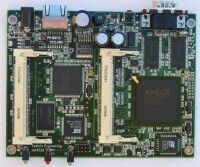 This compact, low-power, low-cost, advanced communication computer is based on a 100 or 133 Mhz 486 class processor. It has one 10/100 Mbit ethernet ports, up to 128 Mbyte SDRAM main memory and uses a CompactFlash circuit soldered onboard for program and data storage. It can be expanded using up to two MiniPCI type III boards. It has been optimized for use as wireless router using Mini-PCI wireless boards, but has the flexibility to take on a whole range of different functions as a communication appliance. The board is designed for long life, low power and extended temperature range. It will be available in any volume in two standard stock versions, and as board only or with a small metal box and various power supplies. The board can be customized according to requirements when ordering higher volume. Please note that the available standard case has cutouts for two RP-TNC Jacks for the external antennas, but does not include the connectors and cables. Please click on picture at the right for high resolution version. Soldered CompactFLASH, 16 Mbyte to 128 Mbyte. Board size 4.0" x 5.2"